Modern minimalism meets contemporary maximalism? Why not? Here’s how to make that linear gas fireplace work with a more eclectic and effervescent design aesthetic. Minimalism versus maximalism. They’re like two fighters competing for the heavyweight title. When one wins, the other loses. After decades of simple, clean lines, the pendulum has swung again. Minimalism has fallen out of favor. Maximalist design is now the style of the day. That’s great news for those with a taste for busy patterns, exciting textures, vibrant colors, intricate details, and eclectic décor—but does that mean the linear fireplace has gone the way of the bare white wall? Not at all. To the contrary, modern, sleek fireplaces have surged in popularity. You can credit timeless design as well as an endless array of customization options. Yet how do you pull it off? 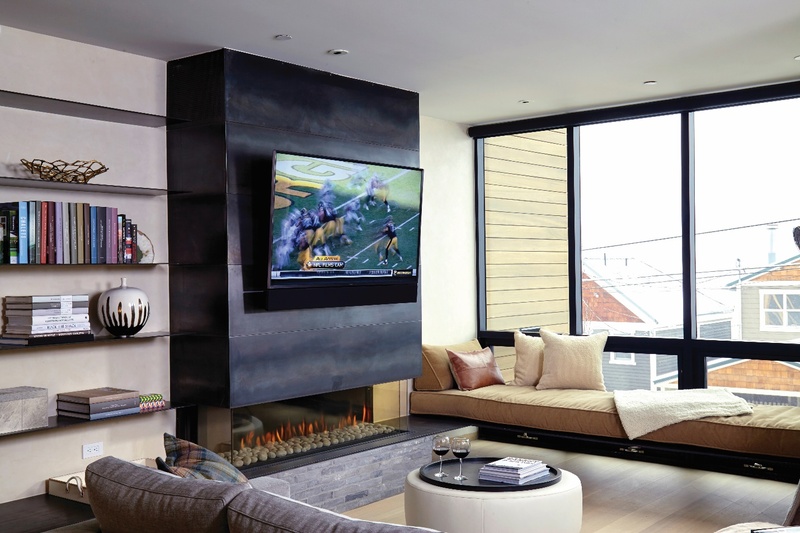 How do you pair a linear gas fireplace with a busier design aesthetic? Try the following tips. Think blue walls paired with red chairs, striped yellow pillows, and a brick fireplace surround. Or how about a fireplace set in gray marble, accompanied by gold chandeliers, faux alligator skin chairs, faux fur blankets, and multicolored area rugs? When it comes to fireplace surrounds, you have plenty of other delicious options—painted tiles; terracotta tiles; brick; stones in different sizes, shapes, and colors. In days gone by, if you installed a fireplace, you lost an entire wall. Between the firebox, the surround, the chimney, and the safety clearance zone, there was no room for anything else. Now, with Cool Wall Technology, you can hang artwork above and around the fireplace. That way, you don’t lose a square inch of decorating space. Hang up paintings, photographs, dangling objects galore—a great way to realize a maximalist’s dream with a minimalist fireplace. Maximalists are collectors, and they tend to be more varied in their tastes than their more restrained counterparts. They love to display antiques, mementos, artwork, flea market finds, and any other interesting curiosity they can lay their hands on—harmony be damned. Where better to stick those sundry artifacts than on a great big ledge that supports a three-sided fireplace or juts out from a corner fireplace? For some, a fireplace and bookshelf combo might seem overwrought or cluttered. A maximalist sees nothing but opportunity in all that extra display space. While a minimalist might be stingy when it comes to books or décor, preferring a sparse arrangement, a maximalist will go all-out. Maybe that means lining the shelves with wall-to-wall books, or perhaps it means creating a smorgasbord of valuables and knickknacks. Maximalist designers pride themselves on having no rules and no taboos. They live for the joy of finding interesting objects and decorating to their heart’s content. That being the case, there’s no reason not to embrace a free-standing or curved fireplace. Although usually confined to kitchens and breakfast nooks, these charmers can fit right at home in a maximalist’s living room or dining area. Why not? Want to soak up more inspiration? Flip through our catalog to explore the possibilities, from see-through fireplaces to Stand Alone fireplaces.